Directors/Screenplay/Producers – Kevin Brownlow & Andrew Mollo, Story – Kevin Brownlow, Photography (b&w) – Peter Suschitzky, Production Design – Andrew Mollo. Production Company – Rath Films Ltd. Following the British army’s retreat at Dunkirk, England has been invaded and conquered by Nazi Germany. Irish nurse Barbara Murray comes to London as part of a civilian evacuation forced by American resistance forces massing off the coast of Ireland. She finds that in order to get a job as a nurse her only choice is to join the pro-Nazi civilian organization known as Immediate Action, which she does even though she is avowedly non-political. However, once in the job, she is faced with complicity in a number of disturbing acts being conducted by IA. The alternate history genre – the genre of scenarios that speculate about the alternate outcome of historical events – has been extremely rare on film. In print by comparison, the Hitler Wins scenario, as used here, is such a prevalent one that the theme is generally regarded as clichéd and overworked. Up until the 1990s and the emergence of the likes of the Hitler Wins film Fatherland (1994) and the tv series’ The Man in the High Castle (2015– ) and SS-GB (2017), as well as other historical scenarios in White Man’s Burden (1995), the superb C.S.A. : The Confederate States of America (2004) and the tv series Sliders (1995-2000), It Happened Here was the sole cinematic voice on the subject of alternate history. (One is excluding various episodes of Doctor Who (1963-89) and Star Trek (1966-9) that offer alternate worlds usually peopled by sinister counterparts of the series running characters as these are not proper historical alternate histories). It Happened Here has rarely been seen since its premiere in 1965 and its video release and theatrical revival in the 1990s was a considerable find. It Happened Here was made over an eight-year period between 1956 and 1963 – indeed, The Guinness Book of Film Facts and Feats (1985) lists it as the film with the longest ever production schedule. The handful of reviews one had read prior to seeing it praised its presentation of an alternate history scenario but as equally tended to take away by referring to its amateurishness. (One gets the impression that the film’s obscurity has had a piratic effect among genre historians, the word amateurism having become a knee-jerk buzzword that gets copied from one review to the next. Certainly, the oft-mentioned amateurishness is rarely in evidence – the occasional moments of acting but hardly even that). None of these reviews however prepared me one for what an extraordinarily literate and powerful science-fiction film that It Happened Here is. The best alternate history stories work by telling their story via the accretion of background details and It Happened Here does this superbly. 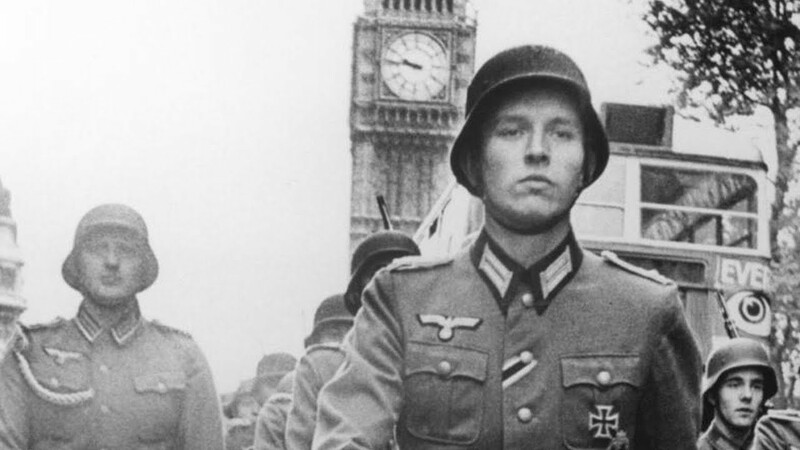 The power the film has rests in its shock juxtaposition of the familiar – Britain in the late 1950s/early 1960s – with the disturbing – images of Nazi occupation. This is never better demonstrated than in the very first shot of the film, which pans past a bobby on a bicycle and then onward to a tank and German troops. A montage sequence that accompanies the heroine’s tour of London is extraordinary. 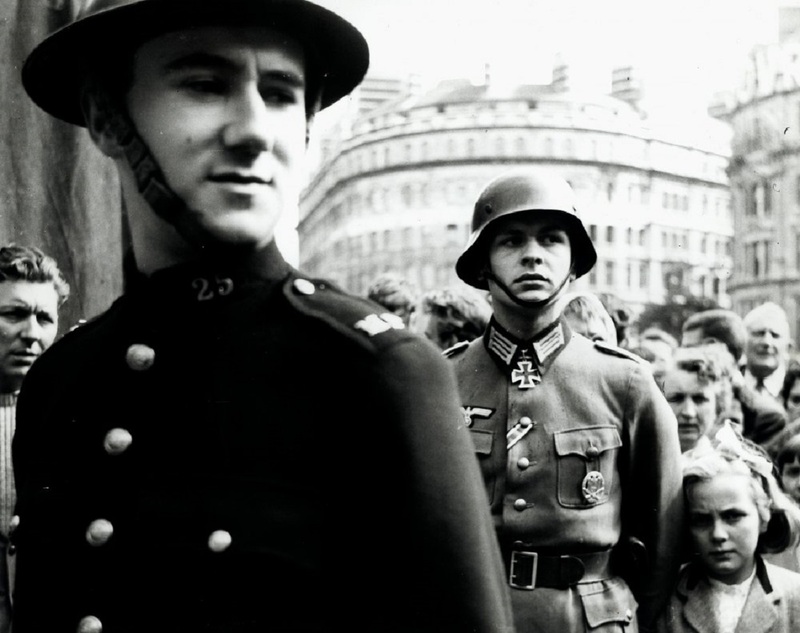 The sequence is told entirely in images where the familiar and the disturbing are combined to unsettling effect – images of German troops lined on the banks opposite the Houses of Parliament, Brownshirts riding on double decker buses, SS officers walking with English lasses on their arms and so on. Equally powerful is a faked newsreel shown during a trip to the cinema. Here directors Kevin Brownlow and Andrew Mollo demonstrate a penetrating grasp of both the nature of propaganda and of the underlying messages of old newsreels. In the exact tone used by 1950s newsreel commentators, the rubble of The Blitz is pointed to and blamed on Jewish and Bolshevist conspiracy. The sequence also uses the incident that actually occurred during World War I where the Allies and the Germans called a truce on Christmas Day and played an impromptu game of soccer in the midst of No Man’s Land. However, the newsreel turns the story – which is usually recounted in the rosy sentiment of the British winning side – around and uses it, just as defensibly, as a piece of propaganda in favour of the Nazi conquest. It Happened Here is devastating in its critique of the British masses. The heroine remains avowedly apolitical throughout – she goes along without question because she wants a restoration of order. The British public, the film seems to say, are not that different. The Nazi invasion is shown to have been adjusted to with incredible ease. A scene where Barbara Murray and members of the IA sit about discussing race and euthanasia during a tea break with all the fascinated disinterest of a discussion of sports results is chilling in its casual off-handedness. The film poses the question “How is it possible to fight fascism when the only means to do so are to use its own methods against it?” The resistance movement is seen as being just as bad as The Nazis, which is a darkly contrary outlook to the prevailing attitude in Britain at the time the film was made that saw the Second World War and the continental resistance as a just cause combating a profound evil. The final image in the film of the heroine continuing to work on, indifferent to either side, as the partisans break through and start cold-bloodedly massacring Nazis and collaborators alike, is a bleak and disturbing end to a powerful film. Kevin Brownlow and Andrew Mollo only went onto make one other film, the highly acclaimed but little seen historical drama Winstanley (1975). Kevin Brownlow now directs and produces tv documentaries about Golden Age Hollywood. He has made works on Charlie Chaplin, D.W. Griffith, director Abel Gance, Buster Keaton, Harold Lloyd, Greta Garbo, Cecil B. De Mille and three works of genre interest, Universal Horror (1998), Lon Chaney: A Thousand Faces (2000) and I’m King Kong! : The Exploits of Merian C. Cooper (2005). Andrew Mollo now works as a production designer and historical consultant for films.